Update - 1 October 2009 - On 11 September 2009, as a sidebar to the posting "Previously Classified Interviews with Former Soviet Officials Reveal U.S. Strategic Intelligence Failure Over Decades," the National Security Archive posted histories of SIOP-62 and 63, with more information declassified by the Interagency Security Classification Appeals Panel (ISCAP). Those updated versions replace the histories originally posted in 2007—Documents 1 and 2 below. More Evidence on the Origins of "Overkill"
The Soviet generals and defense officials interviewed for the BDM study reported that they consistently feared a U.S. first strike during a crisis or confrontation, hence, for years they believed a preemptive option was necessary in the event they detected signs of U.S. military preparations. 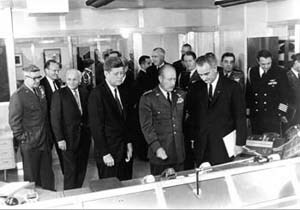 Had they had inside knowledge of U.S. nuclear war plans, Soviet generals may have remained worried because the Single Integrated Operational Plan (SIOP) consistently included a preemptive option. That is, if intelligence warning information indicated Soviet preparations for a nuclear strike on the United States, the Pentagon wanted a capability to launch a preemptive first strike attacking Soviet military targets. Thus, each side feared the other's strategy and believed that a preemptive option was essential for nuclear planning, even if it was difficult to implement successfully and highly dangerous, for example, the risk of a false warning leading to an accidental and horrific nuclear exchange. 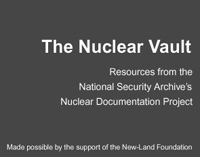 Earlier postings by the National Security Archive of early SIOP histories highlighted the role of the preemptive option in U.S. nuclear planning. Recently the Interagency Security Classification Appeals Panel (ISCAP) declassified more information from the histories of SIOP-62 and 63 in response to mandatory review appeals by the National security Archive. Two years ago, the Defense Department released significant information in those histories in response to a mandatory review appeal by the National Security Archive. Those releases included much new information, but enough remained classified to merit a final appeal to the Interagency Security Classification Appeals Panel [ISCAP]. That appeal persuaded ISCAP to direct the Defense Department to release more content from the SIOP histories. ▪ Radiation produced by the SIOP strikes would have exceeded the "dosage limits set by JCS." This spoke to the worries of government insiders that the plan was so destructive that it would endanger civilian populations on the periphery of the Sino-Soviet "bloc." ▪ Assurance of delivery (of weapons to target) averaged 85 percent, greater than the 75 percent minimum set by the U.S. high command, which raised weapons requirements and the level of "overkill." ▪ The first SIOP targeted 1043 DZGs [designated ground zeroes], of which 706 were in the former Soviet Union. The exact numbers of ground zeroes for China, Eastern European, and other Communist countries—totaling 337—remain classified. P. 20. ▪ To reduce radioactive fall-out hazards to civilians in some of the target countries and nearby allied nations, the SIOP included a constraints policy of minimizing surface bursts in satellite areas. Nevertheless, nuclear planners were to "reduce civil destruction [to the] minimum demanded by military necessity when primary undertakings apply." P. 21. ▪ More details on the "elements of flexibility" developed to make the SIOP more responsive to presidential direction, for example, to hit fewer targets, one option was to execute the plan with SAC and Polaris only (without naval air or NATO forces). (Page 26. While ISCAP significantly more information from the histories, some important details remain classified. For example, from page 19 of the SIOP-63 history, the total number of designated ground-zeroes (DGZs), and probably other information on target numbers was withheld, as was the total number of targets of "strategic significance." As these decades-old numbers aggregate targets in Eastern Europe, the former Soviet Union, China, and North Korea, releasing them now would be unlikely to cause any harm to U.S. national defense. Why they are still so sensitive that they must be withheld is a puzzle. Washington DC, November 21, 2007 - The first comprehensive U.S. nuclear war plan, produced in 1960, was controversial within the U.S. government because top commanders and White House scientists objected to its massive destructiveness—the “high level of damage and population casualties”—according to newly declassified histories published today by the National Security Archive. The war plan also appalled Secretary of Defense Robert McNamara, who wanted to find ways to curb its overkill, but the first nuclear plan revised on his watch remained massively destructive. The nuclear war plan, the Single Integrated Operational Plan (SIOP), has been among the U.S. government’s most sensitive secrets. No SIOP has ever been declassified and details about the making of U.S. nuclear war plans have been hard to pry loose. The availability of options for preemptive or retaliatory strikes against Soviet and Chinese targets. Goals of high levels of damage (“damage expectancy”) were intrinsic to the plan, which explains why historians have treated “overkill”, or excessive destruction, as one of its most distinctive features. The internal debate within the military over the war plan, especially Army and Navy concern about excessive destruction and radiation hazards to U.S. troops and people in allied countries near targeted countries. How the JSTPS constructed the five alternative strikes that constituted SIOP-63 (fiscal year 1963) in order to be responsive to Secretary of Defense McNamara’s quest for alternatives to nuclear attacks on urban-industrial areas, and limit the destructiveness of nuclear war, by focusing on nuclear targets only (“no cities/counterforce”). The role of “strike timing sheets” in the plan, showing how each bomber and missile would reach its target without destroying each other (“fratricide”). The documents highlighted in this release are declassified histories of the Joint Strategic Target Planning Staff (JSTPS), the organization which produced the SIOP from 1960 until the end of the Cold War. Since the 1990s, the National Security Archive used the FOIA several times to attempt to secure declassification of the SIOP-62 and SIOP-63 histories, but the Pentagon withheld the most interesting and important portions. Three years ago, the Archive made another request for the same documents, this time using the mandatory review process. While the declassification office at the Pentagon’s Washington Headquarters Services initially withheld much information, an appeal produced notably better results compared to those obtained from the earlier FOIA requests. This is especially true of the SIOP-63 history, which is significant because this plan had a major influence on U.S. nuclear strategy during the years that followed. As has been noted in these pages before, among the U.S. government’s most sensitive secrets have been the details of U.S. nuclear war plans, once known as the Single Integrated Operational Plan (SIOP), more recently renamed OPLAN 8044. (Note 2) More has been learned about early U.S. nuclear war plans over the years (Note 3), but it remains difficult to persuade the U.S. government to declassify historical information about how it planned to wage nuclear war. Prime examples of the declassification challenge are the histories of the Joint Strategic Target Planning Staff (JSTPS), the organization which produced the SIOP from 1960 until the end of the Cold War. Stationed at Offutt Air Force Base, NE, the director of the JSTPS wore another hat as Commander-in-Chief of the Strategic Air Command (CINCSAC). (Note 4) Almost every year, the SAC history staff produced an account describing how the JSTPS produced the latest version of the SIOP. All of these histories are highly classified and attempts to secure the declassification of the most important details from them have usually been unsuccessful, even when appeals were filed. The most basic elements of the SIOP were “strike timing sheets,” which stipulated how and when missiles and bombers would reach targets without accidentally destroying each other. The high priority of military targets; according to the National Strategic Targeting and Attack Policy (NSTAP), the SIOP was “to destroy or neutralize the military capabilities of the enemy. How the JSTPS constructed the five alternative strikes that constituted SIOP-63 in order to be responsive to Secretary of Defense McNamara’s quest for “no cities/counterforce” in order to limit destructiveness of nuclear war. Goals of high levels of damage (“damage expectancy”) were intrinsic to the SIOP, which prompted criticism from some members of the Joint Chiefs of Staff and senior commanders about excessive destruction (“overkill”) and radiation hazards. This explains why some historians have treated “overkill” as one of the SIOP’s most distinctive features. JSTPS target analysts developed “target islands”--“groups of proximate installations” encompassing missile sites, air bases, command headquarters, factories, etc., which were to be destroyed by striking “desired ground zeroes” (DGZs) (see page 19). the three groups of targets that comprised the National Strategic Target List (NSTL) (see page 24): 1) the “minimum NSTL” of installations that had to be destroyed to meet the goals of the National Strategic Targeting and Attack Policy (NSTAP) (described on page 17), 2) air defense targets that had to be destroyed to reach the primary targets, and 3) “other targets” of value and opportunity. internal debate within the JSTPS over a) the size of the target list, which some thought was excessive, b) the role of weather factors in planning strikes by carrier aircraft, and c) the extent to whether the “assurance [of delivery] factor” was too high (see pages 26-28). The first and third concerns shaped apprehension within the U.S. government that the SIOP was an instrument of overkill. The internal critiques of SIOP-62, which extended to the White House Science Adviser, are disclosed in more detail in the SIOP-63 history which follows. Significant details remain classified, of which the most important may be the numbers of DGZs. Information on page 20 shows that the history includes a breakdown of targets in the “Sino-Soviet bloc,” including the Soviet Union, China, Eastern Europe, and possibility North Korea and North Vietnam. Previous declassifications show that the total number of DGZs as of the fall of 1960 was around 1700. This excision, among other, is under appeal at the Information Security Classification Appeals Panel (ISCAP) at the National Archives. The Joint Chiefs of Staff took the matter in hand by issuing new guidance, which included more detailed instructions than they had given previously (see “SIOP-63 Guidance, pp. 13-17). Taking into account the wishes of Secretary of Defense McNamara for counter-force options, the guidance called for minimizing damage to the U.S. and its allies, a strategic reserve force that could be used for strikes after the initial exchange, and identified three “tasks”: destruction of nuclear forces only and destruction of non-nuclear military forces (both of which tasks would exclude targets located in urban-industrial areas), as well as destruction of urban-industrial targets and co-located military forces and “government controls.” Based on the three tasks, the guidance stipulated five attack options, which could be launched in various combinations: two preemptively and three under conditions of “tactical warning.” While the definition of preemption is withheld from this history’s glossary, it generally referred to an attack launched after receipt of unambiguous intelligence of imminent Soviet plans to attack the United States. “Tactical warning” referred to detection of a surprise attack, which, depending on the warning’s timeliness, suggested the possibility of a U.S. strike under conditions somewhere in a continuum between launch-on-warning and launch-under-attack. With the plans to avoid cities in the first two strike options and thereby “minimize damage to people and industry,” the Joint Chiefs hoped to satisfy Secretary of Defense Robert McNamara who had, in private and public forums, been pressing for a “no cities” counterforce nuclear strategy as a way to limit the destructiveness of nuclear war and to strengthen U.S. bargaining position during a conflict. “Preparing the Plan” (pps. 17-27) gives a close look at the complex task of preparing the SIOP, which took eight months after guidance was received (compared to only a few months for SIOP-62). The work involved numerous tasks including: preparing the list of DGZs, determining the appropriate application of force, charting routes for weapons sorties, resolving time over target (TOT) conflicts so weapons did not destroy each other, and finally preparing strike timing sheets for each sortie. A major difficulty was the application of constraints policies so that weapons bursts did not create fallout that could threaten “friendly, neutral, and satellite areas” on the Soviet and Chinese periphery. SIOP-62 had no constraints policy because it assumed the detonation of the “single largest weapon” on each target, but SIOP-63 guidance was not rigorous enough to prevent fallout from accumulating in some areas. While the details are classified, it is possible that the constraints policy conflicted with damage expectancy for strategic targets and that the latter goal had priority. A key statement on U.S. nuclear policy, Robert McNamara’s “Athens Speech,” is one of the first expositions at the NATO-level of the “no cities-counterforce” concept that Pentagon officials and RAND consultants had developed. 1. Reminiscences of Admiral Roy L. Johnson, USN (Ret. ), US. Naval Institute, Annapolis MD. 2. For OPLAN 8044, see Secrecy News, 15 September 2005. 3. See David A. Rosenberg, "The Origins of Overkill: Nuclear Weapons and American Strategy, 1945-1960." Steven Miller, ed., Strategy and Nuclear Deterrence (Princeton: Princeton University Press, 1984), 113-182. 4. 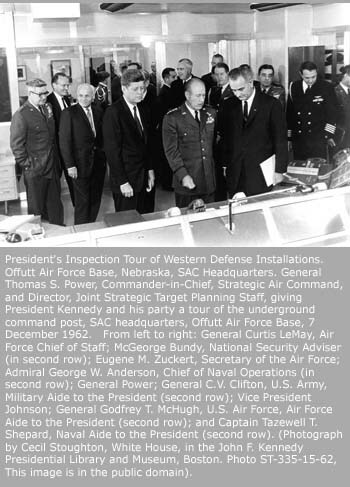 At the end of the Cold War, the functions of the JSTPS were folded into the U.S. Strategic Command, also at Offutt AFB. The STRATCOM division which handles JSTPS-like functions is Global Strike and Integration (GSI). 5. For more information on the development of SIOP-62 as well as citations to significant studies of the early SIOP, see “The Creation of SIOP-62: More Evidence on the Origins of Overkill,” National Security Archive Electronic Briefing Book No. 130. 6. Peter D. Feaver wrote in the 1990s that the SIOP was a “sheaf of computer paper.” See Feaver, Guarding the Guardians: Civilian Control of Nuclear Weapons in the United States (Ithaca, Cornell University Press, 1992), 60. 7. For background on the history of “no cities/counterforce,” see Fred Kaplan, The Wizards of Armageddon (New York: Simon and Shuster, 1983). See also Lawrence S. Kaplan et al., History of the Office of the Secretary of Defense, Volume 5, The McNamara Ascendancy 1961-1965 (Washington, D.C.: Historical Office, Office of the Secretary of Defense, 2006), 306-307. 8. See Raymond L. Garthoff, A Journey Through the Cold War: A Memoir of Containment and Coexistence (Washington, D.C., Brookings Institution, 2001), 124. 9. The strike timing sheets either evolved into, or were an information source for, a document that SAC missile launch officers used in the 1970 and 80s. According to Bruce Blair, president, World Security Institute (and a former SAC missile launch officer), a “Free Launch Schedule (FLS), popularly referred to as the 'FLISS', consisted of many pages of time ranges in which a missile could be fired under each SIOP option. The FLS is based on the ERT--Execution Reference Time--which basically designates the time that the SIOP war begins for all forces. If a missile(s) was not launched at the opening salvo ERT time for any reason (e.g. maintenance in progress at that time), and it is returned to launch-ready status for firing under the selected SIOP plan, then the crew fires it at the first available open window until all windows close according to the war plan. The bombers had similar sheets to calculate their next free strike window to drop their bombs on target. The idea was to ensure that missile warheads and manned bombers did not arrive at the same target at more or less the same time.” Message from Bruce Blair to editor, 20 April 2007. 10. Predelegation is not mentioned in these sources, but other declassified documents describe the guidelines in effect during the early 1960s. 11. Deborah Shapley, Promise and Power: The Life and Times of Robert McNamara (Boston, Little Brown, 1993), 110, 200-201. 12. For background on the early quest for limited nuclear options, see “The Nixon Administration, the SIOP, and the Search for Limited Nuclear Options, 1969-1974,” National Security Archive Electronic Briefing Book No. 173. 13. Daniel Ellsberg, Secrets: A Memoir of Vietnam and the Pentagon Papers (New York: Viking, 2002), 57-58. 14. By contrast, the briefing to President Kennedy on SIOP-62 survived; see Scott Sagan, "SIOP-62: The Nuclear War Plan Briefing to President Kennedy," International Security 12 (1987): 22-51.